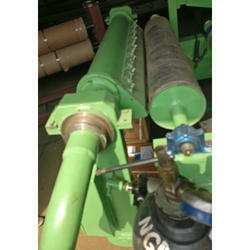 Prominent & Leading Manufacturer from Faridabad, we offer air knife coating machine. Air Knife Metering Machine are now the main system used for coating special papers. With their wide range of coating weights and operating speeds, they are extremely flexible and so deal for coatings with low solid content. Air knife coaters are particularly suitable for the application of undercoats to paper and cardboard. However, they are also ideal for topcoats and special paper treatments (thermal papers, NCR papers, inkjet papers, etc).